Bold climbing up to E7 on a first free ascent of a 25 pitch big wall sounds more than enough to be getting on with. But then there was the jungle and the ants as big as cockroaches, and cockroaches the size of rats, and worms burrowing into your feet. John Arran describes living the high life in the land of the Yanomami. Picture the scene. Deep in the South American jungle, the huge Orinoco river carves an azure swathe through impenetrable and endless green. A small dug out boat casts off from the riverbank, its cargo of climbers and equipment sheltered from the sun's dangerous heat under a thatch of leaves. Spin forward through two days of blissful ease, punctuated by occasional dips in the warm clear waters as the boat navigates up progressively smaller rivers until a shallow rapid prevents further progress. Imagine here the tiny fishing village of Seguerra, all ten families of it, where the lives of the local people appear to have changed little for centuries. Now look out across the roof of the jungle at a vast monolith, apparently erupting from within the heart of the forest and believed by the native Piaroa to be the stump of the felled tree of life; the tree from which the entire universe was born. Notice the tower's flat top and its steep rocky flanks, and feel your eyes drawn to the unclimbed South west Face, where the clean yellow rock rises steep and unbroken throughout its full 700m height. 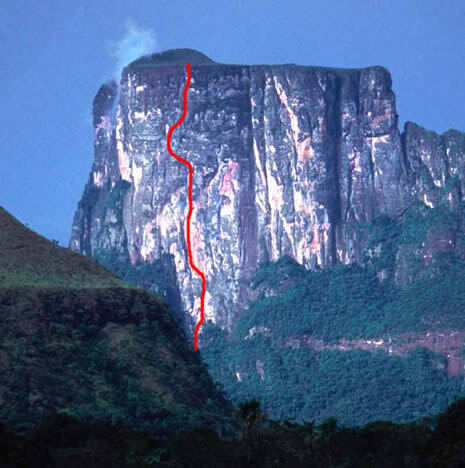 Welcome to Cerro Autana, a finer climbing objective it would be hard to imagine on the surface of our shrinking world. Day Four My mind was focused on a distant hold which remained stubbornly out of range, even if I could find a way to stay in balance on the overhanging wall to reach for it. I looked down to my left, where an offset wire was valiantly gripping the edge of a flared crack, I looked down further, past a brass micro to a Quadcam l hoped might hold. I tried not to look any further, to the 200m of air beneath. If I was wrong, I'd soon be plunging through the first 30m of it. `Watch me!" I shouted to Anne on the belay and, twisting a foot high inside of me I extended across the bulge, one hand gripping a sloping side edge while the other reached optimistically above, I wasn't sure I really should be doing this, but I'd been on the pitch for nearly two hours already, had passed some of the boldest onsight climbing I could remember, and was becoming fanatical about not letting it beat me now. Besides, it's really scary lowering off bad gear. So I twisted more, extended further and groped urgently until two fingers chanced upon a tiny edge. Decision time. Fingers pulled, body contoured to the shape of the bulge, limbs extended and finally the hold arrived, allowing me to plug a good cam into the slot by its side. I fell off straight afterwards, exhausted and defeated, but strangely happy that I'd made it past that move, which at first sight had seemed impossible and still remained unreasonable. After a practice session and a good rest I was able to head/redpoint the pitch, though even with a vast supply of motivation the 8a climbing at the top took everything I had left after four days on the wall. My tips were thin, feet aching and muscles sore, which was unfortunate because above us loomed a huge roof and if I was to have any chance on it at all I would need to recover pretty quickly on our ledge that night. It had all been José's fault. 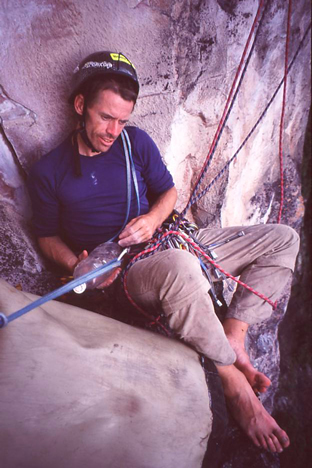 He'd enlisted us as replacements after Leo Houlding had retired hurt from Patagonia. We had been kicking around Caracas after backing off another big wall, when who should arrive in town but my old friend José Pereyra, returning to Venezuela on one of his frequent jungle jaunts from his home in Salt Lake City. 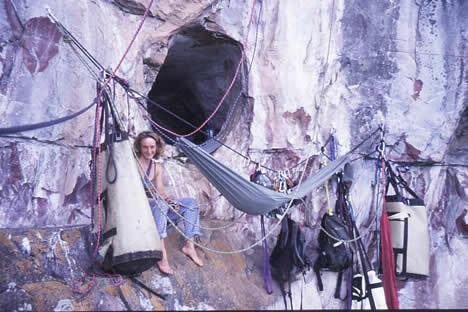 It was spooky not having seen him for fifteen years since he and I were in the US together, and more so when one of the first things he asked was whether we wanted to come with them to Autana big wall climbing? We'd heard about Autana from locals André and Ivan. who we'd already been on a wall with. We knew the team had tried it last year and had spent nine days bushwhacking and hauling loads through the dense jungle just to get to the bottom. We knew they'd spent fifteen days getting only 400m up and that they'd had to flee in a hurry when the 'authorities' had got to hear there were people climbing the tower without seeking an official permit, which apparently would never have been granted anyway. We'd heard about the worms that burrow into the skin between your toes and lay eggs. about ants the size of cockroaches and cockroaches the size of rats. We were warned about the humidity and about the almost daily rains, that once your clothes got wet they could take weeks to dry. We knew all this, so when the question was asked, Anne and I looked at each other, realised there had never been a choice to make, and replied: "We'd love to." José's idea was that an aid team including himself and US speed waller Timmy O'Neill would press ahead, pushing the aid line higher and fixing ropes as they went. Anne and I would follow free climbing all the aid pitches, which sounded unlikely to me but José was confident. "It'll go free for sure," he said, "and other than Leo you're the only one I know who could do it. I chose not to ponder that his memory of my climbing was fifteen years out of date, and accepted the compliment. ". There's a pitch higher up will probably be 8a, then the one above may be 8a+, after that it could get hard." I wasn't sure if he was winding me up, so I nodded, smiled and kept a nervous silence. As it happened, he wasn't. It was not until we were straining under mighty loads, struggling to follow the overgrown trail, that the details started emerging: "There was one pitch I was on for hours. I got real scared and decided I needed a bolt, but the rock was super hard and I was only on a small ledge and the bolt didn't go in right and ended up sticking out about two inches and bent over. I had to lower off it in the dark and climb past it the next day. 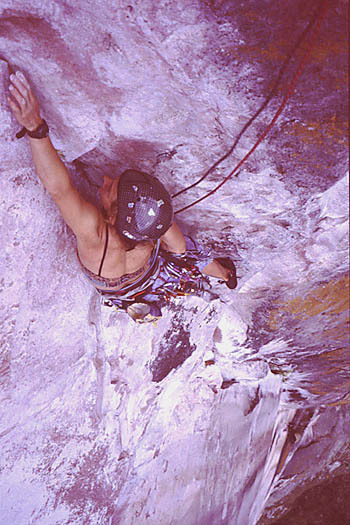 There's a pitch higher up will probably be 8a, then the one above may be 8a+, after that it could get hard." I wasn't sure if he was winding me up, so I nodded, smiled and kept a nervous silence. As it happened, he wasn't. Day Nine One of the rites of passage on Autana is that you must accept the inevitability of failure, you must come to realise that in spite of your best endeavours it has beaten you. Only then will it let you pass. We know this now, after spending two days straining, smearing, palming, slapping, falling, swearing and failing on 40 feet of excruciatingly thin technical bridging. Too tired to argue with it any more and resigned to allowing the wall a point of aid, it finally allowed us to climb it yesterday on the third day of asking, to an awkward mixture of relief, elation and extreme fatigue. "John!" A shout from two pitches above where the route had led the aid team onto a wet and vegetated wall. 'Yeah?" "You should come up and look. We can't find a way through. We may have to go down." "Just give me half an hour and I'll be with you." 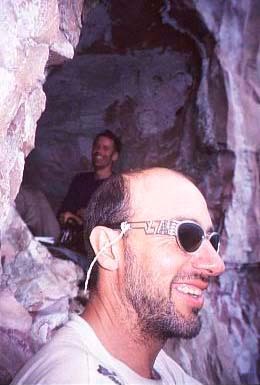 The aid team had already retreated down a short vegetable pitch, pulled back across a wet aid traverse, and were gearing up to have a last look at an unlikely steep line above, which to my eyes could lead only to the terrain of ultimate doom. Water, vegetation, hardly any gear and no prospect of change for two hundred metres had combined to thwart further progress. Naturally they had tried, but the slabby wall was too wet, too steep and too dangerous to stand on let alone climb. Except to my eyes the original way would be the only way, so back we went for another look. Now each one of us had conceded defeat, and in return the gods of Autana smiled on us. 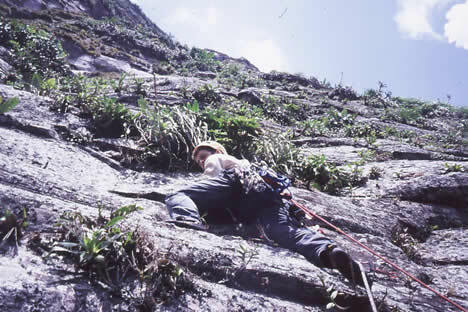 When we arrived back at the highpoint next day the rock had almost dried out, the smears now had friction and the difficulties proved surprisingly short lived, Swinging leads we gradually gained momentum, relishing the change of angle and the exit from the drainage shower that had blighted the previous two pitches. Five pitches and another 200m of climbing took us to within hoping distance of the top, and smiles were the order of the night when we abseiled in the dark down to our hammock and cave lodgings. It would have been impossible without Lucho. A main man in the local town of Puerto Ayacucho, he's one of those people who knows everybody and is known by everybody. He's also one of the very few outsiders to speak the language of the Yanomami tribe - a hunter gatherer people of around 20,000 who until the early 1980s had had virtually no contact with the outside world. Lucho has become the main point of contact for documentary film makers and researchers. Watching him guide our boat upriver, waving and chatting to people in every passing boat or settlement, was a real education in diplomacy. Were it not for him it's unlikely the Seguerra villagers would have let us near the wall, But Lucho was coming with us and even though he wasn't a climber he was to jumar the 700m to the top. He guided us through the jungle, sniffing out vague clues as to where the trail once went, keeping a sense of direction when visibility was down to ten metres of dense thicket, and finding drinkable water in the most unlikely of places. He did at least wear shoes to protect against the sharp rocks, branches and creatures that lurked in the undergrowth, which is more than can be said for the local villager also walking with us. Still, that made it easier for him to shin up the occasional tree to get a better view, which he did with a speed and grace few climbers could match. It was a shame that Lucho didn't make it to the top. He went up a few pitches by way of practice while we were still climbing above, but then Ivan became steadily weaker and more sick. Lucho escorted him out to the nearest town and Ivan took the first flight to Caracas. He would spend three days on a drip and next year recovering from hepatitis. It made the wasp stings, ant-bites and Anne's wormy foot seem trivial by comparison. Day Five Roof crack day. José had sneaked a look as he jugged up past it, thirty feet or so out from the wall. "The first few moves are gonna be super hard," he reported, "but after you turn the lip there's a crack all the way, and it's really not all that steep." Sure, it was only 15º or so overhanging, and yes, it had a crack all the way up, but the crack was eight inches wide! I wanted to believe him but I should have known his tactics by now. On the approach he'd said how he was looking forward to watching me lead the first pitch, as he'd so much enjoyed leading it himself last year. Then we arrived at the base to find his first pitch was actually 60m of assorted vines and twigs, poorly attached but tied off as runners anyway, up a steep and blank looking slab. 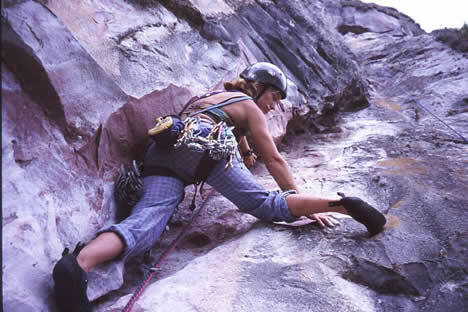 I'd got away with it that time because the slab turned out to be unusually dry and climbable, albeit without much pro, and I'd had a thoroughly enjoyable time on the perfect rock between his vines at about E5 6a. This time I may not be so lucky. Bridging higher, I pulled out from the corner on a thin finger lock, seemingly wrong handed but allowing me to twist and launch up for an edge high on the side wall. So far so good. A powerful layback past the rounded lip and good gear ensured these difficulties were purely physical. Only then could l see into the crack above, and only then did I appreciate the true horror of what I had let myself in for. Sure, it was only 15º or so overhanging, and yes, it had a crack all the way up, but the crack was eight inches wide! l really wish the next half-hour of comedy had been videoed, as l improvised and sweated to gain more height than I was losing, all the while feeling I would at any moment be unceremoniously ejected. I found wires at the back but found it desperate to clip them as both ropes wedged firmly between body and rock. And l couldn't turn my head to see as my helmet would only fit in the crack sideways. When the bits of me I'd managed to keep in the crack finally emerged to hang from a sloping shelf I was exhausted, both mentally and physically. Unfortunately it still wasn't over, since after another bulge the crack turned into a shallow square-cut recess, maybe a foot across and six inches deep, and still overhanging. The only way up it was a very strenuous layback, and the only way to start that was a chest-ripping Gaston move. Twenty feet of ferocious barn-door laybacking later I was once again ready to accept failure as inevitable. I'd shouted "watch me!" more times than I could remember and quite frankly I was knackered. I probably would have given up there and then but my last gear was some way beneath me and I really hate falling, so I slapped optimistically onward and upward, somehow managing to stay attached until better holds arrived and I collapsed onto a perfect bivvy ledge with a huge grin on my face. Day Eleven Summit day. Above our bivvy there were now 300m of fixed rope to the top. José and Timmy had topped out, but in the process they'd aided the second last pitch, and after all we'd come through we were determined to see it all climbed free. But it shouldn't be too hard, José assured us, now that it was clean. Yeah Right. An eternity of jumaring and hauling later we finally arrived at the foot of the pitch. now the only thing standing between us and our ultimate goal. Arriving at the same time was a huge black storm cloud, and rain was already in the air. We'd had several storms in the past few days and they seemed to be getting worse. The start of the wet season was imminent but so far we'd always managed to get away with it. I set off as fast as possible, in the certain knowledge that rain would soon stop play, and for once José was spot on; there was the occasional 6a move but really the pitch was just a 60m E3 which finished up a long and wide but not terribly difficult crack. In my haste though I managed to generate huge amounts of rope drag, which made sprinting for the top all the more difficult, and as the spots of rain got heavier I was glad the wall was still quite steep. I heaved onto a tiny ledge at the top of the pitch to be greeted by a huge clap of thunder and raindrops the size of marbles. Tucking into the corner for shelter I tried to bring Anne up, but the rain was so loud we couldn't communicate. With the rope jammed, all I could do was retreat from the cold rain and hold tightly onto the rope. Minutes later a torrent of water exploded from the back of the corner where I was sheltering, as though someone had just opened a fire hydrant. I was belayed so tight I could do nothing but brace myself and shiver. Anne had quickly twigged the rope was stuck and transferred onto the fixed line, but tied into my vertical river, the same torrent Anne was now jugging up in, it all seemed to take an age. Hypothermia had seemed impossible in the jungle, but I believed it now. Huddling together under a nylon sheet on the summit was all that kept us safe as the thunderstorm raged into the evening. 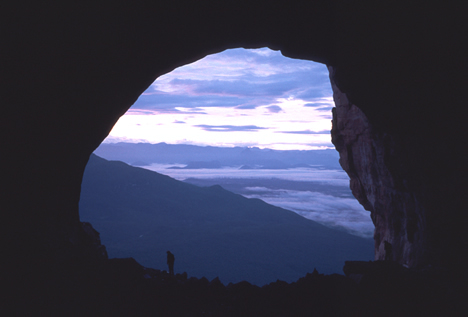 It was too dark and dangerous to find the Autana Cave, so we all spent a very unpleasant night with few clothes and little or no shelter, warmed only by the knowledge we'd achieved what we set out to do, albeit by the narrowest margins possible at every turn. We found the cave the following day, three abseils down. It is an astonishing feature. Passing clean through Cerro Autana, with a huge arch at either end, the cathedral sized cavern is said to be the biggest of its kind in the world, providing a serene and surreal place to recover from what felt like the biggest ordeal we had ever enjoyed. This expedition was supported by the BMC/Sports Council, HB Climbing, Boreal and Lyon Equipment, to all of whom many thanks are due. 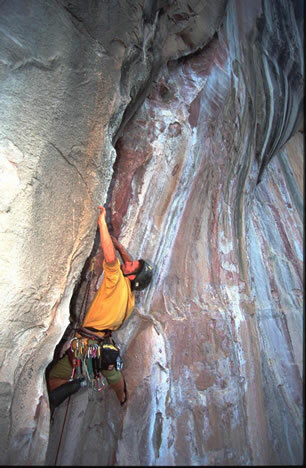 This article, by John Aran, first appeared in the August 2002 issue of Climber magazine.